Sugars are the simplest form of carbohydrates found in fruits, dairy products, candy and table sugar. There are several different types of sugars, including fructose, lactose, sucrose and galactose. Your body uses specialized enzymes to digest sugars and produce energy. Certain people may be born without the enzymes needed to digest a particular type of sugar, leading to intolerance of that specific type of sugar. Sugar intolerances can cause different symptoms, depending on the particular type of sugar. Perhaps the most well-known type of sugar intolerance is lactose intolerance. Lactose is a disaccharide sugar molecule composed of glucose and galactose that is found in milk and other dairy products. Lactose intolerance is caused by a deficiency of the enzyme lactase, which breaks lactose down into galactose and glucose. Lactose deficiency often develops after the age of 2, when many people's bodies begin to produce less lactase. The symptoms of lactose intolerance often develop within 30 minutes to two hours after eating dairy products. Common symptoms include excess gas and flatulence, abdominal pain and bloating, diarrhea, and nausea. Fructose is a monosaccharide, the simplest type of sugar. During digestion, the body breaks fructose down into smaller organic molecules using the enzyme aldolase B. Fructose intolerance is a hereditary condition, meaning people are born without the enzyme aldolase B. Symptoms of fructose intolerance often develop as soon as an infant starts eating formula and food. Frequent vomiting and difficulty eating are often early symptoms. Irritability and excessive sleepiness may also result. In some cases, infants with fructose intolerance may experience convulsions, and may develop jaundice, a yellowing of the skin and eyes. Galactose is another simple monosaccharide, similar in structure to glucose. Galactose intolerance is also usually inherited, and develops early in infants, particularly after ingesting dairy products. The symptoms are very similar to fructose intolerance, including vomiting, poor feeding and failure to gain weight. Irritability, lethargy or excess sleepiness may also develop. Infants with galactose intolerance may also experience convulsions and jaundice. Combining the simple monosaccharides fructose and glucose together produces the disaccharide known as sucrose. Pure table sugar or cane sugar is made up of sucrose. The body breaks down sucrose for digestion using the enzyme invertase, which is sometimes called sucrase. 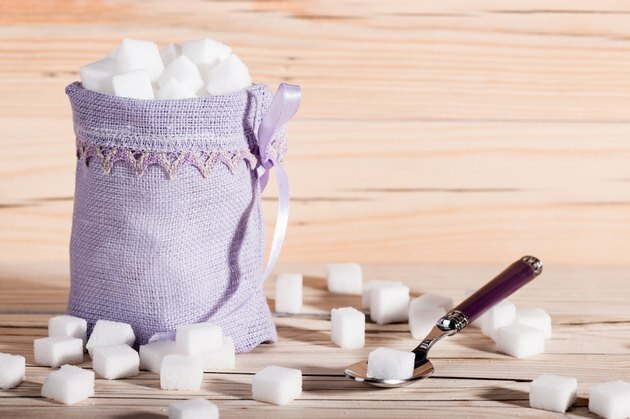 Sucrose intolerance can cause symptoms that are similar to lactose intolerance, including excess gas, flatulence and abdominal pain and bloating. Sucrose intolerance can also cause more severe symptoms, such as nervousness, anxiety, heart palpitations and heart arrhythmias.